Here’s one we missed, so let’s get caught up with it now. Bird & Squirrel are the creation of writer and artist James Burks (creator of Gabby & Gator). According to the publishers, “Squirrel is afraid of his own shadow. Bird doesn’t have a care in the world. And Cat wants to eat Bird and Squirrel. 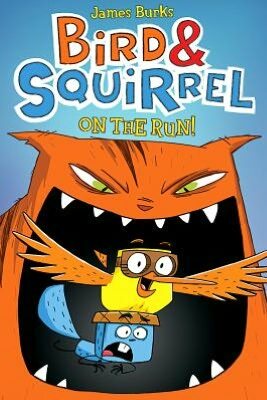 Of course, he’ll have to catch them first, and that’s not going to be easy.” In their first full-color graphic novel, Bird & Squirrel on the Run, you can “join this trio as they head south for the winter in a hilarious road trip. But watch out! Cat is waiting around every bend, and he’s one pesky feline.” Now comes word of a new graphic novel, Bird & Squirrel On Ice, in which our oddly-matched heroes crash-land in Antarctica, finding themselves taking part in a secret penguin ritual. Both are published by Graphix, and you can find them care of Barnes & Noble.